Two years ago, the cargo ship known as El Faro was sailing from Jacksonville to Puerto Rico. Near the Bahamas, the ship sailed straight into a hurricane, causing it to sink. As a result, all 33 crew members aboard the ship lost their lives. Recently, the owner of the El Faro settled wrongful death cases with the families of 28 of those crew members. In late September 2015, the El Faro set sail from Florida to Puerto Rico. When the ship left, the storm that would eventually become Hurricane Joaquin was not a particularly significant weather pattern. The ship’s captain, Michael Davidson, was an experienced sailor and was not worried about the ship’s route bringing them so close to a tropical storm. Things changed, however, when the storm began to increase in severity. Meteorologists were reporting winds at 100, and later, 120 miles per hour. The ship’s third mate, aware that the overnight route would be putting the El Faro within 22 miles of the storm, suggested to the captain that they change course. While the ship did alter its course, the fast-moving storm kept moving in its path. Around 1am on October 1, 2015, the storm was upgraded to Joaquin, a category 3 hurricane. Three hours after Captain Donaldson declared the ride “not that bad,” the El Faro was in deep trouble. The ship was listing in Joaquin’s harsh winds, the propeller has stopped working, and water was pouring inside. After sending two alerts out to the Coast Guard, the captain had no choice but to ring the abandon ship bell. The crew was forced into the torrential waters of the Atlantic Ocean, where they all perished. The grieving families of El Faro’s crew filed wrongful death suits against the ship’s owner, Tote Services Inc. and Tote Maritime Puerto Rico. Tote has settled all cases, but as one attorney points out, the cases are not about the money. Rather, they are a chance for the families to learn what really happened that fateful night, and why their loved ones were not allowed to turn back to safety. While Tote admits no wrongdoing, the company claims its focus is on the crew member’s families. If you’ve lost a loved one due to another person’s negligence, you understand how the families if the El Faro crew feel. Their settlements are less about getting paid, and more about making sure their loved one’s memories are honored, and the negligent party is forced to admit they are responsible for committing a grievous error. 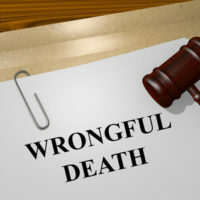 The Florida and Georgia wrongful death attorneys at Gillette Law, P.A., also understand what you need, and they are not afraid to fight for justice for your family. Call us today to discuss your case.